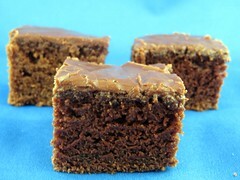 Sounds earily similar to Texas Sheet Cake which is one of my all time favorite cakes. I’ll have to try this too. I love buttermilk! those looks delicious! Those sound really good. I made lemon yogurt cake last night (a tweaking of a lot of recipes), and will be making lemon curd to go with it tonight. Otherwise, this cake would be on the short list! I made this tonight and it was by far the best chocolate cake I have ever made! I loved it warm and even heated it up today. I just can’t say how great this cake was and easy too! My kids loved making it with me(they are 2 and 3) and even more so they loved eating it. I’m hoping I have enough willpower to not eat the whole thing! Abigail, this recipe is on my go-to list now, I love it too! I still can’t believe how easy it was. And you’re right, it was amazing warm. I’m kind of glad I brought it into the office because I know otherwise I would have eaten way too much! This has become my boyfriend’s new favorite cake! I love how spongy it is. Thanks for the recipe! What size pan did you use? These look great! @Sara – Hi Sara, I used a 13×9″ pan.